Caverns Deep! includes an extensive variety of terrain, features and enhancements. We have crumbling Ruins, a pestilent Mushroom Grotto, perilous Ice Catacombs, reptilian infested Water, and if we can unlock them, illuminated Crystal Caverns, the treacherous Underdoom, and Dreadhollow Forest, a brand new Wilderness terrain system. The company has been unveiling each of what they are calling encounters one by one. 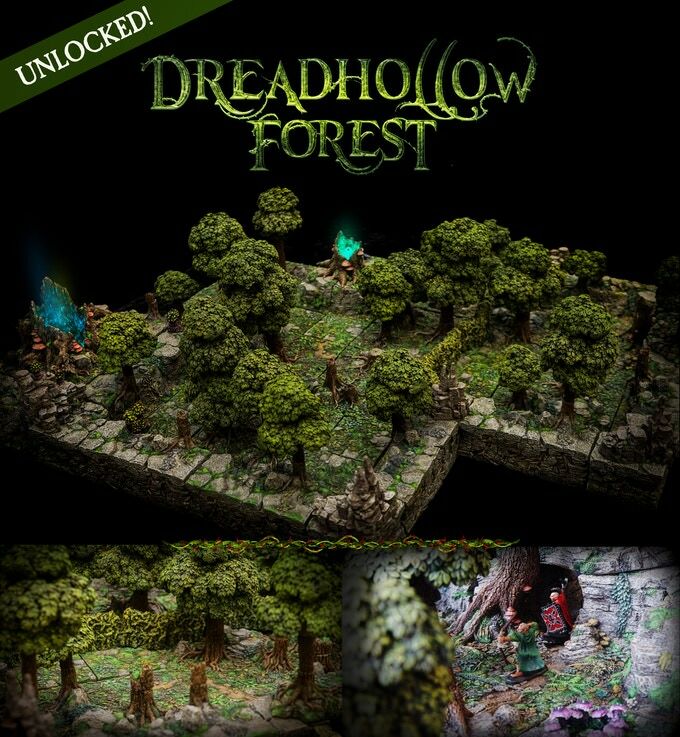 At Gen Con they unveiled the 15th encounter which was Dread Hollow Forest. I thought this thing was purely amaze balls. Part me watching this just thought geez DMs really don't get encounters in the wild right. There are so many things we are doing. It seems natural to go into castles, caves and dungeons but there is just so much beauty in going into a forest. Seeing what a company like Dwarven Forge can do in the natural world is intense. I really hope they pursue projects like this in the future. This set is by no means cheap but damn is cool to check out. If you like what you see here you should also check out the Dwarven Forge Town, Dungeon and Castle set up. To me looking at their products is like walking into an art gallery. Yeah I said their products are art, beautiful, creative, amazing art.